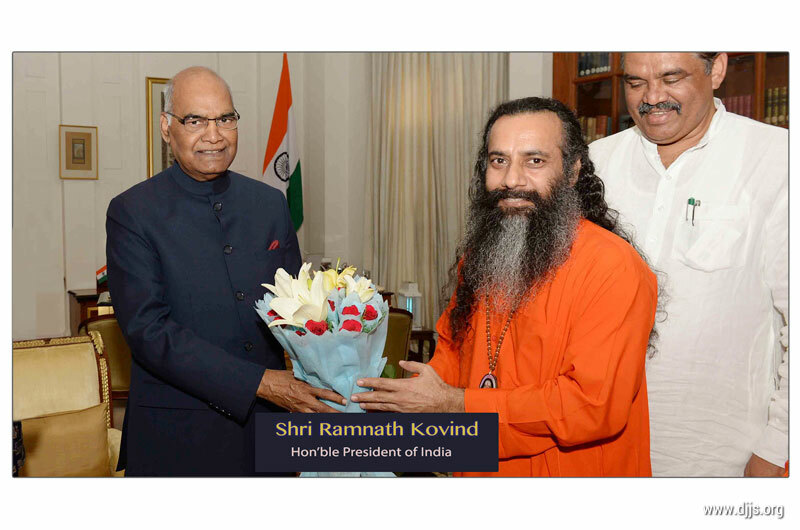 It is a matter of immense pleasure and pride for the Preachers of leading Socio- Spiritual Organization - Divya Jyoti Jagrati Sansthan (DJJS) to meet India's New President-Shri Ramnath Kovind Ji. Revered preachers- Swami Narendranand Ji, Swami Adityanand Ji and Swami Parmanand Ji, congratulated the President for taking the huge responsibility towards nation. DJJS preachers humbly invited the President for Divine event of Gopashtami, wherein people worship cows and pledge to protect their lives. Gopashtami is celebrated on the 8th day after Diwali, when Lord Krishna took over the responsibility of the cowherd. The preachers also handed over DJJS spiritual literature to the honourable President, along with the latest release - 'Shri Ashutosh Maharaj Ji- The master and the Mystic'. Our President applauded the great work and projects where DJJS is putting its hundred percent effort to achieve its world noble mission of Divine light Awakening and World Peace.